Is China now the world's top supercomputer power? 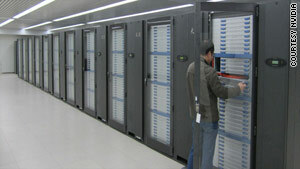 The Tianhe-1A supercomputer in Tianjin, China: Power is nothing without control. (CNN) -- China is an emerging superpower, and now, also an emerging supercomputer power. This week, the country's Tianhe-1A supercomputer was ranked number one on the most recent Top 500 list of the world's most powerful supercomputers. Tianhe-1A (meaning Milky Way in Chinese) has knocked America's Jaguar system to second place. Coming in third, yet another ultra fast Chinese computing machine called Nebulae. Located at the National Computing Center in Tianjin, the Tianhe-1A, runs at a top speed of 2.57 petaflops per second (one petaflop equals 1,000 trillion calculations per second). It reportedly will be used for oil exploration and aircraft design. Just three years ago the top supercomputer was IBM Blue Gene and operated with just a half-petaflop; today it is ranked only 12th on the list. The U.S. remains the foremost supercomputing power on the planet with 275 of the world's top 500 supercomputers on the list, which is published twice a year. People in the U.S. should take note. I don’t think this is something to panic about, but people should not be complacent. But with China's and Tianhe-1A ascent to first place, some are asking whether a supercomputer race could soon be underway. In total, China has 42 ultra-fast computers on the Top 500 list, surpassing Japan, France, Germany and the UK to become the number two supercomputer producer behind America. "People have to ask what this means in terms of global competitiveness," Charles Leiserson, a professor of computer science and engineering at the Massachusetts Institute of Technology, told CNN. "People in the U.S. should take note. I don't think this is something to panic about, but people should not be complacent." Supercomputers mean a lot in terms of global competitiveness. Long symbolic of a nation's scientific and economic strength, high performance computing machines are crucial to solving complex problems in areas stretching from climate change to finance. They are used by governments to simulate the detonation of nuclear bombs, by scientists to map DNA, Procter & Gamble even uses them to design potato chips. In other words, making powerful supercomputers is not just a matter of national pride it is also a matter of advancing scientific research, making new discoveries and bolstering national defense. In short, supercomputers matter, a lot. That is why China has been working on making its own for more than a decade, according to James Lewis, a senior fellow at the Center for Strategic & International Studies who authored a report on China's national strategy for the development of its IT industry. "It is not a surprise," Lewis told CNN. "One of the things you see with the Chinese is they set these prestige goals, like putting a man into orbit. Once they achieve it, you have to ask, 'What do they do next?'" It is a question Chinese supercomputer developers are also asking. Now that they have the machines, what are they going to do with them? Yes, we have Tianhe-1A up there on top, but we still lag behind the Western world a lot. "Yes, we have Tianhe-1A up there on top, but we still lag behind the Western world a lot," said Nie Hua, vice president of the Beijing-based Dawning Information Industry Co., which built Nebulae, the third fastest supercomputer on the Top 500 list. "Making supercomputers is not so hard, but to use them wisely, we still have a lot to learn." Creating software for use on systems that can perform mathematical operations about 29 million times faster than supercomputers built in the 1970s can be one of the biggest challenges computer scientists face. "It is a very good image to show the world that we have a very advanced supercomputer," Nie told CNN. "But due to the incapability of developing applications, it won't generate much impact on our economy and day-to-day life. Even if we can make them in China, we will still be five years behind America because we don't know how to use them." Nie said the applications run on their supercomputers are used to increase the efficiency of the country's transportation systems or to monitor and control people's behavior on the internet. The Chinese are also using American computer parts to build their supercomputers, including chips and microprocessors from Nvidia Corp and Intel Corp., raising skepticism abroad about China's technological know-how in terms of building a supercomputer the country can truly call its own. "They are using all of these American chips inside," said Leiserson of MIT. "That is a good thing. It means they are becoming more economically dependent on [the United States]." Yet there is one homegrown component used in China's top machine that has caught the attention of supercomputer builders in the West called the interconnect, or networking technology, which basically allows all of the smaller computers making up the giant computer to talk to each other. According to computer scientists, the interconnect is one of the most difficult pieces to build. "The fact that they built their own interconnect really shows a commitment to taking on a part of the technology for which there is no dominant leader," Leiserson said. Supercomputers also have plenty of power when it comes to attracting the top scientists to the research centers or universities that house them, adding a certain cache that goes beyond crunching numbers. In the U.S., fewer and fewer universities house supercomputers on campus. Even MIT uses supercomputers located somewhere else, according to Saman Amarasinghe, a professor in the college's department of electrical engineering and computer science. "It is a sad development," he said. The U.S. first lost its top spot on the supercomputing list in 2002 when Japan unveiled a machine more powerful than the top 20 American supercomputers combined. The U.S. regained its number one position in 2004 but has lost it once again. "The long-term implication for the U.S. is that China is seriously interested in high-performance computing and is developing and deploying computing resources," Jack Dongarra, a University of Tennessee computer scientist who maintains the Top 500 supercomputer list, said in an email. "However this isn't a race."